A small team of dedicated people are responsible for growing our grapes and making our wines. We take great pride in the wine we produce and each and every one of us is committed to making wines that will provide exceptional enjoyment. Salut! 1942, as the winds of WWII swept over Europe, our vineyard owner and family patriarch, Serafino "Sam" Vena, emigrated from Calabria, Italy, where his family had been vintners for generations. After settling in Wisconsin, the Venas became farmers and Sam spent his childhood working the land and learning to successfully plant and grow crops. Every year, the extended Vena family would purchase grapes from California and make wine to enjoy with family and friends. These family gatherings were a highlight for the Vena clan. Everyone joined in to crush the grapes in a big wooden tub in the basement of the farmhouse. Afterward, in true Italian style, there was much feasting and celebration. Although he would go on to join the military and eventually become a teacher, Sam never lost his affinity for growing things. After settling in Orange County, California, Sam purchased an avocado orchard and grew avocados for several years. But always in the back of his mind was the pull of his family's heritage and he started to look for a vineyard. Very quickly, he focused on the renowned wine regions of Northern California, eventually purchasing 24 acres in Knights Valley, Sonoma County in 1994. Thus Vena Vineyards began. For the past 17 years, Sam, and later his son Greg, have devoted themselves to growing the highest quality fruit. Greg grew up immersed in that uniquely Italian-American culture that celebrates wine, food, family and hospitality. For Greg, wine is a symbol of sharing and community, a way to bring people closer and create enjoyment in everyday life. The second of Sam's four children, Greg grew up in Southern California, part of a big extended family. Greg remembers family gatherings where "there was more food and wine than you could ever hope to eat, and lots of talk and laughter. Everyone was having a really good time." After getting an MBA at UCLA in 1989, Greg established a successful career in real estate. When Sam bought the vineyard in 1994, Greg was enthusiastic about the opportunity to use the family's grapes to make wines that could be used to celebrate the connection of family and friends. In 2007, Greg took over some of the day to day responsibilities of running the vineyard and began to plan for the debut of Vena Vineyards wines. Tony grew up in Marin County and his father owned a vineyard outside of Healdsburg, in Dry Creek Valley. Tony says "I learned very early that vineyards equal hard work... and I decided I wanted to do something else with my life". However he also had an entrepreneurial streak, so while still in high school, he rented his father's tractor and built up a client base for vineyard work. Upon graduating, he attended San Francisco State University and majored in business, eventually starting a career in real estate. At the same time, however, Tony found he missed the outdoors and enjoyed the wine business. In 1977, he founded a small winery, with partners, and in 1980 he had an opportunity to buy a vineyard management company thereby turning his after school work into a full time occupation. Tony has managed Vena Vineyards for 14 years, and has a thorough knowledge of how to grow the highest quality grapes from this land, down to the specific grape characteristics produced by individual rows of vines. Tony's philosophy is to maximize the grape's ability to ripen and gain flavor, while using sustainable practices wherever possible. After 32 years in the business, Tony still appreciates the opportunity to work close to the land and enjoy an outdoor lifestyle. Each year, he looks forward to seeing the results of his efforts vinted and bottled into the finest of California wines. Penny's interest in wine began when her family moved to the Livermore Valley. However it took a few years and the words of a friend to convince her that making wine was a career that did not require belonging to a winemaking family. In 1986 she landed a job as crush help at Jordan Vineyards & Winery, which lead to a 13 year career at Jordan. She was there for the inception of J Vineyards and Winery. In 1999 she was hired as the Assistant Winemaker for J, eventually working her way up to the Sparkling Winemaker position. 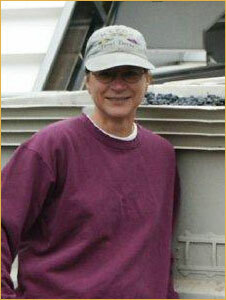 In 2007, Penny left J to work as a Winemaker for Rack & Riddle Custom Wine Services. Since 2010, Penny has been the winemaker for Vena Vineyards. She enjoys the camaraderie of a group of people devoted to crafting wine of honesty and superb varietal character. Penny believes in letting the fruit speak for itself. As she says, "with the fruit from Vena Vineyard, my goal is to use winemaking techniques to showcase that varietal expression." Outside of wine, she loves cooking, fly fishing, gardening, and traveling.